Oil on panel, 35 x 46 cm. All-consuming flames burst from the roof of a farmhouse, lighting up the night sky over a small Dutch village. The dramatic fire is reflected in the lake in the foreground, where several peasants are gathering water to douse the fire. The painter Egbert van der Poel had a penchant for depicting landscape scenes featuring the violent forces of nature at work. This included the so-called Delft Thunderclap, where in 1654 a gunpowder store exploded and destroyed much of the city, as well as a number of scenes depicting village fires at night. 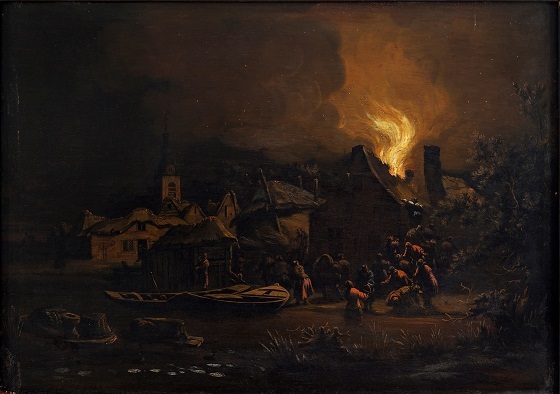 This scene of a village fire is characterised by an extensive amount of detail dedicated to the men and women, some of whom are attempting to fight the fire while others are desperately trying to save their belongings from the flames. All of them are rendered in a clear and crisp outline, amplified by the light from the fire. The stark contrast between the light of the fire and the darkness of the night also highlights the dramatic nature of the scene.